AT various points throughout his disturbing, funny and exceedingly ambitious debut, James Flint's readers are bound to look up from the page and wonder, "How in the world is he ever going to pull all this together?" "Habitus" is an unabashedly postmodern science fiction novel, drenched in theory, but with all the biting humor of Martin Amis. It presents itself initially as a novel in the tradition of, say, Goethe's "Elective Affinities" or Richard Powers' "The Goldbug Variations." The author chooses a model (a chemical theory for Goethe, the double helix for Powers) -- some machine of science charged with both philosophical repercussions and narrative potential. Then he assigns a character to each of its components, gives them a shove and off they go to fulfil their destinies. Led by the right hands, this literary dance can be beautiful to behold. The variations on the theme, the subtle patterns within the overall structure, give the sterile model a unique life of its own. Flint, a former technology journalist for Wired UK, mute and a handful of British newspapers, once traded a dissertation on chaos and complexity theory for an M.A. in philosophy and literature, so it's hardly a surprise that he's chosen a relatively abstract and obscure model for his story -- a Habitus. The concept is "explained" in an opening quotation from Gilles Deleuze, a name that raises another flag: The universe you are about to enter is not going to behave in an orderly or predictable fashion. "The eye binds light, is itself a bound light," writes Deleuze. "This binding is a reproductive synthesis, a Habitus." Got that? Fortunately, Flint's epic casting of the idea is much more entertaining. He begins with a bit of blatant semaphore, introducing three main characters -- all of whose names, like his own, begin with the letter J.
Joel Kluge is a Hasidic Jew and a mathematics prodigy (klug, by the way, means "clever" in German); for his family, however, he's a problem. Flint's setup for Joel is a classic heart-tugger. He knows the reader will pull for Joel as he devises his escape from his father's Brooklyn bakery to Cambridge, where the equations of Bertrand Russell, A. J. Ayer, Whitehead and Wittgenstein once cross-fertilized, spurred and inspired each other. But Flint pulls off an emotional double whammy once Joel's explorations in abstract mathematical theory lead him back to the roots of the kabbalistic tradition. Even geniuses get homesick. Judd Axelrod, son of an English actress and an outrageously successful American computer salesman, is yanked from his beloved Los Angeles and plopped down in Stratford-upon-Avon, where his mother has nailed a gig with the Royal Shakespeare Company. As lonely boys are wont to do, he falls in with the wrong crowd, gets into trouble and is yanked right back to L.A. There, he's sentenced to spend his after-school hours with Dr. Schemata, a veritable caricature of all that's rotten about psychoanalysis. Judd is a victim of parental neglect, a strange condition called picnolepsy and the evil doctor -- so it isn't difficult at all for Flint to secure a bit of emotional investment in poor Judd from the reader. Jennifer Several is the product of a gangbang in a mental hospital. Not long after Jennifer is born, her mother undergoes Britain's last prefrontal lobotomy, so Jennifer never meets her. But she has her mother's husband to care for her -- until he begins to disintegrate into drink. Again, sympathy for Jennifer is all too easy to conjure up. With all this emotional attachment taking place, some readers may become frustrated or even angry when the narrative and the very laws of nature slowly unravel -- and the fates met by our three protagonists turn out to be neither tragic nor comic but just plain bizarre. But it wouldn't be as if these readers hadn't been warned. Orbiting the terrestrial goings-on is Laika -- the legendary, historic, first dog in space, blasted out there by the Soviets and abandoned. She was expected to live seven days at the most, but many artists can't forget her. Songs have been written for her, and just last month, a performance in Munich sent messages floating skyward in the hopes that she'd receive them. Flint, too, takes liberties with her story: He stuffs her with media. Like Carl Sagan, Flint seems embarrassed for our species' habit of airing our dirty laundry to the rest of the universe by hanging it out on infinite broadcast waves. Laika is tuned in to it all. She feeds on it, and it bloats her body until she fills every nook and cranny of her tiny capsule -- eventually, she becomes a sort of orbiting cyborg potato. By the time Joel, Judd and Jennifer collectively conceive a single child, all bets are off. Up to this point, several turns in the story have been preceded by concise two- or three-page lessons taken from the histories of space flight and computers. Sputnik and John Glenn, Alan Turing and Charles Babbage -- they're all here, distantly related to our cast of characters yet grounding the fiction in verifiable fact. But then these lessons begin to describe the development of a telepathic embryo with two hearts throughout a pregnancy that lasts two full years; the expression of a lizard that appears in the pattern of the throws of the dice; and the reasoning behind Joel's conviction that, given enough data, he could eventually explain the Holocaust. "The girl turned towards her and for a second Jennifer was shocked by the face. She had never known it, except in fragments, and here it was complete and flooded with light. It was a face of exquisite ugliness, a face which broke every rule of proportion but so subtly that the effect was quite disarming. It lacked symmetry ..."
And so does a tree. Without being too reductive, the story pulls Joel, Judd and Jennifer from their disparate roots toward a center -- where they never quite align as expected -- just before they're flung away from each other again. As the title of one of the briefest sections has it, "The world has ideas of its own." All this would be mere fodder for yet another dissertation if Flint weren't such a damn fine writer. His relentlessly dark humor and startling juxtapositions; the occasional sweeping passages that read more like prose poems than establishing shots or descriptions of the scenery; and the near overabundance of wild, wild ideas -- all of these make "Habitus" a marvelously provocative read. SO far, 1998 has been the year where hip novelists try to make sense of our 20th century lives. 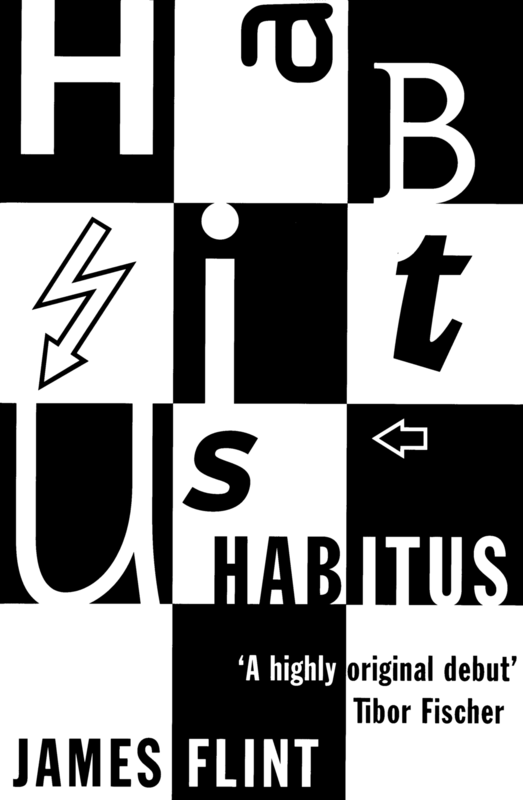 Following on from Douglas Coupland's 'Girlfriend in a Coma' comes James Flint's 'Habitus'. In many ways they are similar books. For example the most important character in both is a child conceived in a peculiar manner, who grows up to be messianic Equally both books are strangely millennial in tone, although without specifically referring to it. However, where Coupland is an inward-looking author, Flint is more interested in the technological world man creates and inhabits. He was, after all, a technology writer for Wired and it shows here. Not since Thomas Pynchon exploded with 'Gravity's Rainbow' has a debut author tried to create such a scientifically transcendental universe. Quantum theory, genetic mutations, Alan Turing, the secrets of cabalistic Judaism, Benoit Mandelbrot, Laika (the first dog in space), probability theory, JFK, the Internet, fractals, predictive theories of gambling, Fermat's last theorem and the theological paradox of good and evil all have their place in this novel. Unsurprisingly, the plot sometimes gets a bit confusing and many people might buy this only to file it unfinished next to Stephen Hawkins' seminal 'A Brief History of Time'. Flint's attempt to make sense of the rise of information and the way it's changed our lives may be doomed to failure, but it's an entertaining ride. BY plugging the visionary concepts of Deleuze and Guattari's A Thousand Plateaux, Sadie Plant and Manuel de Landa's digital materialism into the long duration of the generational saga, Flint updates the Huxleyan novel of ideas into a 467-page science-fictional epic that scales from cellular to molecular strata with an impressive degree of complexity. IN his debut novel, James flint carries three characters and their associated lives with apparent ease. Jennifer seduces Judd and then, years later, Joel. The result is a child, Emma, with two biological fathers and three strands of DNA, but physically unusual and with a greater consciousness than the norm. The book is an excellent philosophical satire, constantly drawing lines between machines and humans - all observed from orbit by Russian space dog Laika. While occasionally dipping into scientific explanation, the story moves along rapidly, drawing people and events together to reveal a larger picture. JAMES FLINT's first novel is quite something. The first 400 pages race by in a thrilling tale of three young people joined in a unique experience - a baby, Emma, formed from the genes of all three, although two of them know nothing of her existence. Teenager Jennifer, born of a mother raped in a mental institution, seduces the very young Joel, the son of a black American computer salesman and an English film star. Whisked away to avoid adverse publicity effecting the latter's career, Jennifer takes on Joel, a lonely obsessive, busy trying to pin down God in the paradigms of chance. Flint takes great relish in the perceptive, humorous histories of his three main characters, who are all the time circled by Laika, the astrodog forgotten - presumed dead - in space. Flint's observation is entrancingly spot-on, but it is in his ambitious meld of mathematical philosophy, laid against a backdrop of gambling and the development of the computer (there's enough info here to bore your friends at parties) that 'Habitus'excels. Alongside perhaps only Richard Powers ('Galatea 2.2'), Flint has managed to find an enthralling fictional world in the contemporary technological maze. The climax involving Laika, Emma's burgeoning mental powers, the Kabbalah and the increasingly self-absorbed behaviour of most of the protagonists will probably put your head into a spin, but the writing remains as controlled as ever. A captivatingly entertaining experience of a distinctly unusual kind. LET nobody dismiss James Flint's Habitus on the grounds that the author is a technology journalist, for the clever use he makes of scientific history casts a veil of credibility over his characters' imagined histories. The novel chronicles three lives, while relating them to the history of spaceflight. Laika, the first dog in space, acts as an observing angel, having evolved into a higher consciousness and become a cyborg, at one with the circuitry of her space capsule. Flint makes substantial borrowings from computer conspiracy books, but it is not clear how far he shares their agenda. Does it matter that this mad, maddening blend of techno-chat and cybersex is, in the end, less than fully synthesised? Perhaps it is better to say that the excessive sub-routines are part of the point, and to applaud the innovative approach to literary form. Flint almost succeeds in stitching literature and science together, and he has a sure sense of structure. YOU probably won't have heard of James Flint, but to judge by his astonishingly accomplished debut you will soon. 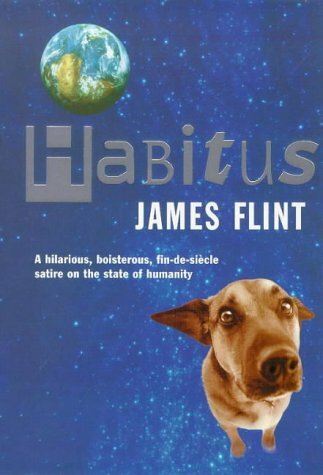 In Habitus, Flint weaves the lives of his three well-drawn characters - Joel, Jennifer and Judd with telling events in science to build a witty, often erudite, frequently stylish commentary on our pre-millennial condition. Joel, a Hasidic Jew from Brooklyn, is a mathematical genius. After leaving CERN, he devotes himself to computers, and becomes increasingly obsessed with the Holocaust. Jennifer is the disturbed daughter of a child abuser and becomes the last woman in Britain to undergo a prefrontal leucotomy (on the day Luna 2 landed on the Moon). Judd, the black son of a mixed-race American couple, is a professional gambler. He and Joel contribute sperm to the ovum that becomes Jennifer's child Emma - apparently some kind of superhuman, who eventually makes contact with Laika, from Sputnik II. Still alive in the 1990s, she has quietly evolved into a superdog as she monitors Earth's media from orbit. At times Flint bludgeons you with science: major events in the lives of his three main characters invariably coincide with a major event in the history of science and technology. Joel was circumcised in January 1950, the month that Time first carried a picture of a computer on its cover; Jennifer was born in August 1960, as satellite Echo 1 reflected a radio message from Eisenhower; and Judd began his career of disaffection with authority as Saturn V carried Skylab into space. Their lives mark out the history of the last 50 years of the second millennium, and engage with some of its obsessions in a book that falls into an unusual genre: not a science fiction novel but a science novel. SPANNING three generations and three continents, Flint's hugely ambitious début is an epic novel about the links which hold our lives together and the relationships we have with one another, with our history and with the cosmos. It charts the lives of threemain characters: Jennifer Several, born in a mental institution in Stratford-upon-Avon on the same day as NASA's ECHO 1 demonstrates the feasibility of global satellite communications; Judd Axelrod, half-caste son of a movie star and an IBM programmer, conceived in LA in July 1962 after nuclear tests over the Pacific result in his mother's ova being released a day early; and Joel Kluge, born in Brooklyn to a Hasidic Jewish baker and circumcised on November 3 1957, the day the USSR launch Sputnik II. Its cargo: Laika, the first dog in space. Flint's control over his complex fictional world is masterful and his range of perspectives immense. Although presumed dead back on Earth, Laika the spacedog develops an advanced state of consciousness and, from her viewpoint in the planet's orbit, monitors our transition from the space age through the digital revolution. From this omniscient vantage-point Flint zooms in to focus on the lives of Jennifer, Judd and Joel; three characters with wildly different backgrounds whose lives are nonetheless interconnected and inexorably brought together. Frequently, the narrative zooms in much closer, until it focuses on the basic building blocks of these characters' lives; their cells and DNA. In chapters called "Spermatogenesis" and "Half An Egg", Flint describes his pubescent characters from the inside out and of Jennifer's DNA he writes: "via her mitochondria ... Jennifer is linked to the eukaryotic cell from which all plants, fungi and animals are descended." Characterisations are thus grounded in the context of not only parental upbringing and environmental background, but also of an ancestry reaching back into prehistory. At times these ineffaceable links to prehistory mutate into a sense of biological predestiny, which in turn renders the characters motiveless and thus lifeless. But this is offset by a series of random, often cruel, twists of fate best exemplified in the chapter "Fishfingers Can Be Fatal" (I'll leave you to discover how for yourselves). In an imaginative and increasingly bizarre book Flint forces the reader to suspend disbelief further and further, daring us to challenge pseudo-scientific explanations which are so endearingly far-fetched that we are, in fact inclined to accept them. The author's academic background (philosophy and literature) is evident throughout, but his frequent asides on evolution, computers and chaos and quantum theories are usually well integrated into the characters' own obsessions. The layers of thematic complexity add to, rather than suffocate the deep-rooted humanity that suffuses the book and only occasionally does the veil of fiction slip, when characters are invented for the sole purpose of being lectured to by other characters. The sheer complexity of the plot allows a few non sequiturs to slip in unnoticed and the pacing is a little uneven, but overall Habitus is a highly promising début, inventive and packed with wit, which suffers only from an attempt to cram in more than could ever really fit in its 460 pages. THAT the size of James Flint's first novel is biblical is not the only similarity with the Good Book. There is an overwhelming sense of the monumental from beginning to end: absolute truths, theories of everything, Holocaust. The tone is anything but suburban. It's sincere and serious. The story is about the lives of three people, Jennifer, Judd and Joel (getting the Biblical connection?) who form an un-holy trinity resulting in the birth of a two-hearted child after a two-year pregnancy. But this is rushing ahead. Joel is the son of Hasidic Jews, a wizard mathematician who escapes his culturally tyrannical parents to study at Cambridge and then do particle research at CERN. Judd is the son of a Hollywood film star and a bigwig at IBM who is discovered to have been seduced by Jennifer when only 10 years old (living in Stratford while his mother was with the RSC) and thrown into oppressive therapy with the Dickensian-sounding Dr Schemata. Jennifer is the daughter of Nadine, committed to a mental hospital and raped by one of the hospital workers. Nadine's husband, Henry, a pathetic old alcoholic, brings Jennifer up as his own. It is one of the book's ironies that Jermifer, who seems the most unpromising child, is the one who actually produces something miraculous. She ultimately achieves a kind of freedom while the other two, for all their intelligence, implode in their attempts to find the truth. What truth? That's difficult to answer. Joel, experiences the kind of enlightenment that might be interpreted as a breakdown after a lecture on chaos theory and searches for patterns and theories to explain the Holocaust. Along the way, he invents a machine that can predict the trajectory of a ball on a roulette wheel. This connects him with Judd, who escapes from his psychotherapy only to become trapped in the hypnotic underworld of gambling. And all the while, the Russians' space dog, Laika, is orbiting the Earth. She watches, godlike, over the world. Launched into space when computers were in their infancy, she can be seen as a modern deity, or the modem god of computing. In a twist of science fiction, she cuts herself off from the scientists observing her, takes over the controls of Sputnik II and begins to blend with the machine. I never quite understood if she were a distinct metaphor and, if so, for what. Her eerie omnipresence, and her more prosaic real-life fate, bring to mind the stampede of technology, its human (or in this case canine) cost, and the absurdity of a dog spinning around the globe.